Raise a paw if you think that allowing the meat industry to perform its own inspections, rather than relying on third-party experts from the USDA, is a terrible idea. Well, bad news: The Trump administration is proposing to deregulate inspections at slaughterhouses, slashing inspectors by about 40 percent and allowing pork producers to certify their own meat. Plus, the administration wants to approve an increase in line speed. In other words, the pork industry will get to call the shots at slaughterhouses — and that’s not great for animal welfare, since the industry has a very limited interest in looking out for the pigs it raises for food, beyond keeping them alive long enough to get to slaughter. It’s also bad news for plant workers, who will be under pressure to work harder and faster in conditions that are already dangerous. Those demands increase the risk of serious occupational injuries like limb loss, “degloving” — where high speed equipment peels the skin from your hand and/or arm – and death. It may also impact food safety. Industry inspectors will have an incentive to pass as much meat as possible, and they may lack the expertise of USDA veterinarians who can intercept animals with signs of hoof and mouth or other contagious diseases. The government suggests leaving the training for these inspectors up to processing plants, rather than making sure they have sufficient training and expertise to independently assess health and safety on the line. Furthermore, the USDA intends to rely more on pathogen testing from the industry than on its own testing procedures. In addition to checking the health of animals and the quality of their meat, personnel have historically taken samples and performed lab testing for common sources of foodborne illness like salmonella. This, too, will apparently fall by the wayside, with the industry regulating itself. Clearly the pork industry doesn’t want consumers to get sick, but there’s a reason agencies like the USDA exist. In fact, the agency grew from early 20th century exposes of horrendous conditions in livestock slaughter facilities, as government officials recognized the need for an independent agency to make sure businesses were maintaining clean, sanitary conditions. We already know that industry self-regulation is a bad idea: Just look at what’s happening with Boeing and the FAA. The stakes here are huge. 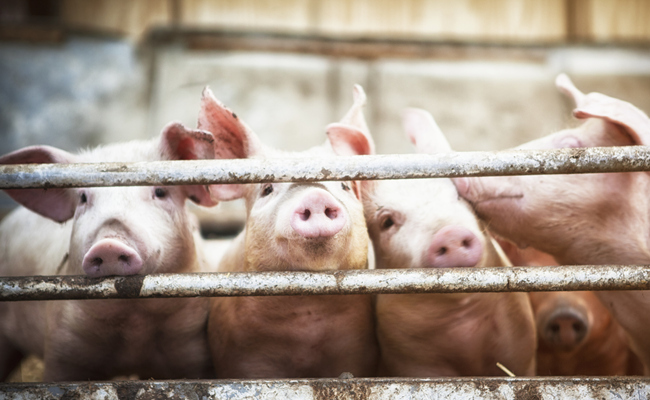 In February alone, 10 million pigs were killed for food in the United States. Lest you think switching to chicken is a good idea, think again, because the Trump administration has already approved similar relaxations on the rules for the poultry industry. Officials are also weighing doing the same with beef. These decisions clearly indicate that the USDA is embracing the Trump administration’s antipathy to regulations and taking the mandate to cut back on “unnecessary” regulations, as well as operating costs, seriously — even at the expense of health and wellbeing. Deregulating the meat industry is a nice reminder that going vegetarian is always a great option for your health, the planet and the welfare of animals. But just going plant-based isn’t enough when these changes will endanger larger public health and safety, harm animals and put workers at serious risk of injuries in a job that’s already one of the most dangerous and unwanted in the country. The Trump administration’s reliance on rulemaking and administrative action has limited Congress’ moves in situations like this, but you can still contact your lawmakers. And when the USDA releases a rule for public comment in the coming weeks, you can weigh in there as well. The day humankind evolved on earth is the day life on earth became a living hell for animals! - All the suffering, torture and pain animals are forced to endure, physically, mentally, psychologically, emotionally and ultimately a barbaric death for the sake of human arrogance, business and profit, just to supply people with a few moments of pleasure to the taste-buds! Totally immoral, unnecessary and unforgivable treatment of animals! Only wild animals need meat, they have to hunt to survive (although many wild animals do not even eat meat), but humans have other choices! ~ "The soul is the same in all living creatures, although the body of each is different." ~ Hippocrates ~ and no one can dismiss the strong possibility of reincarnation! Those who think the exploitation, torturing and butchering of animals is acceptable, who knows?! - Any one of the poor animals subjected to such suffering, cruelty and death could possibly be a reincarnation of someone you once cared about and loved. You could even be consuming them if you eat meat, or you could return as one of the poor animals you have no respect for. After all - Quote - "We shouldn't treat other 'living beings' human or animal in a way we wouldn't want to be treated ourselves. What goes around comes around, if not in this lifetime; any possible future lifetime" - I would never under estimate Karma! Just like the FAA with two Boeing airline crashes with the same causes. Boeing was caught on the phone praising trumps streamline self-regulation and how much that was helping Boeing production. They played that conversation on CNN and for some reason have not played it again, makes you wonder. Regardless of whether they are tame, wild, born naturally, purposely farmed or produced in a lab, ALL animals are 'sentient living beings' on the same level as humans (in many cases more so), with a soul, character, emotions, intelligence & awareness of their own & are fully aware of how they are being treated; they feel pain, fear, anxiety, stress, suffer depression, grieve & cry tears too. Unfortunately most people are too busy using, abusing, consuming & wearing them to care! Like humans animals bond with each other & have a voice & communication of their own, just because it isn't a language of the human species is no excuse to ignore their pleas, cries & screams for life & to live in peace free from exploitation & harm. Animals are people in different bodies,(& are by far better individuals than those who condone & participate in the exploitation & murder of them) it is only the physical abilities between species that sets us apart, humans can do things animals can't & animals can do things humans can't. Sadly humans possess 'egos' causing many to discriminate & arrogantly think they are more important, special & superior to other species, even to their own kind & immorally think their deluded belief of superiority gives them the right to exploit & harm others. They refuse to acknowledge animals are 'sentient beings' making it easier to treat them as 'objects' to exploit & harm.